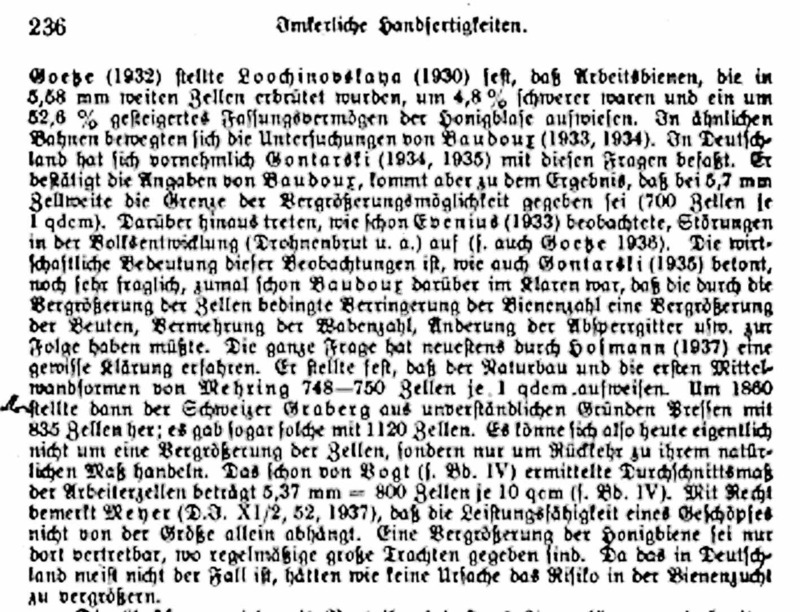 It appears now and then articles in especially the German language stating that the enlarging of cellsize historically never have occurred, but instead what’s happened is going back to normal larger cellsize. And those decreasing cellsize is doing something unnatural. How come? In the English language there are many sources from the 19th and 20th century leaving no doubt an enlarging have taken place. Wildman, Cowan, Root, Cheshire, Bee World in the 1930th, etc. One of the old German icons in beekeeping is Enoch Zander (1873-1957). His book “Die Zucht Der Biene” was first published in 1920. After his death new editions changed name to “Haltung und Zucht der Biene” because they were revised by Friedrich K Böttcher. It was published in its 12th edition in 1989. The book is a classic beekeeping book in Germany. Earlier in the book there are some figures which contradict this statement. Cellsize figures given by a couple of Russian beekeepers, Tuenin and Bogdanov. In the 12th edition from 1989 they say that Tuenin in Tula (120 km south of Moscow) had measured cellsizes ranging between 4.99 mm and 5.26 mm. Bogdanov had in Leningrad measured 5.53 mm to 5.69 mm. (I’m not sure if these cellsizes are from comb with or without foundation. And if without if it’s from a colony whose bees are born in a colony with foundation of large cells. If for example the Leningrad figures come from a swarm from a colony on cellsize 5.4-5.7 it may well draw the given cellsizes the first time they are doing it without wax foundatin. Next generation will draw even smaller if given the chance.) The contradiction between these figures and the conclusion is even more clear if you also have the 5th edition to compare with. In this edition the Tuenin figures from Tula is given to be 4.74 mm to 5.00 mm. The revision in the 12th edition made the contradiction milder changing the figures a little (couldn’t do much harm could it?). The majority of beekeepers in Germany I think still read this book and of course trust the authority. The icon can’t be wrong, can he? I think this book is a big reason why this opinion keep coming up that it’s never been an enlarging of the cellsize. This conclusion of Stever is contradicted by his own list of historical measurements of cellsizes. 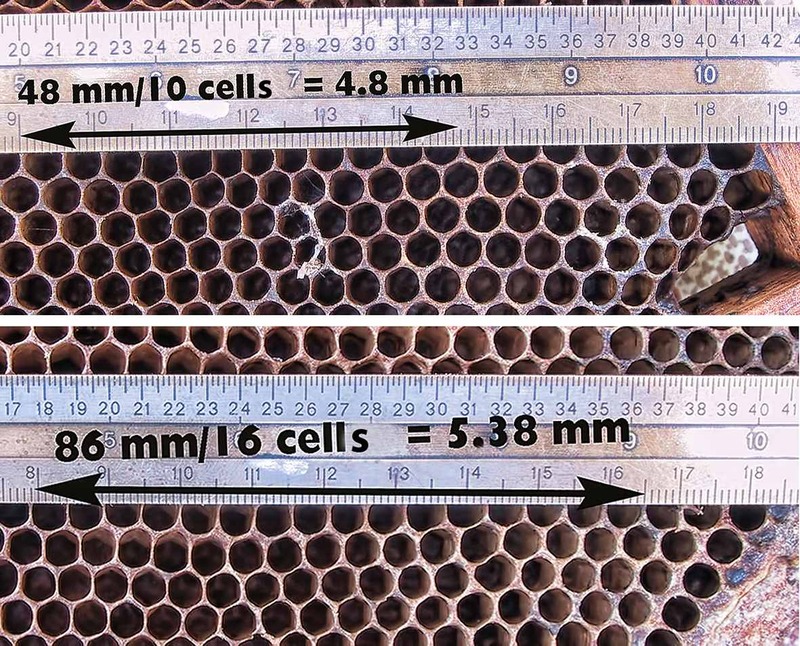 When you read his article and other articles on cellsizes it’s hard to find insight that different sizes in the hive mostly are used differently by the bees. 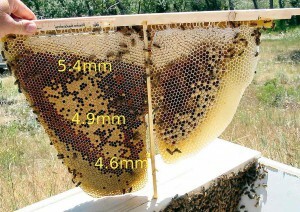 And that the different sizes are often found in certain places on the comb and in the hive. T W Cowan (1890) in a book mentions that larger cells normally are found at the edges of the wax combs and smaller at the center. Today if you study a topbar hive (TBH) which has deep combs enough, you will see that largest worker cells are generally found at the top and furthest away from the entrance. That’s mainly where honey is stored and not where brood is reared. If such a hive is not started with large cell bees you will probably find 5.1 and smaller cell sizes closer to the bottom and the entrance. A topbar comb with Dennis Murrel in Montana. Smallest cellsizes at the bottom close to the entrance. Biggest away from the entrance and at the top. So with all these measurements, where are the samples taken that are measured? And how many are they? Is the whole of the hive covered when samples are taken? Have the bees built the combs without the help of wax foundation? Is it a swarm from a large cell colony or is it a colony that has lived for some generations on combs built and rebuilt by themselves? In some cases you are given the smallest and the largest cellsizes found, so there you know that more than one sample is taken, but also you rarely are presented with the number of samples taken and from where in the hive. 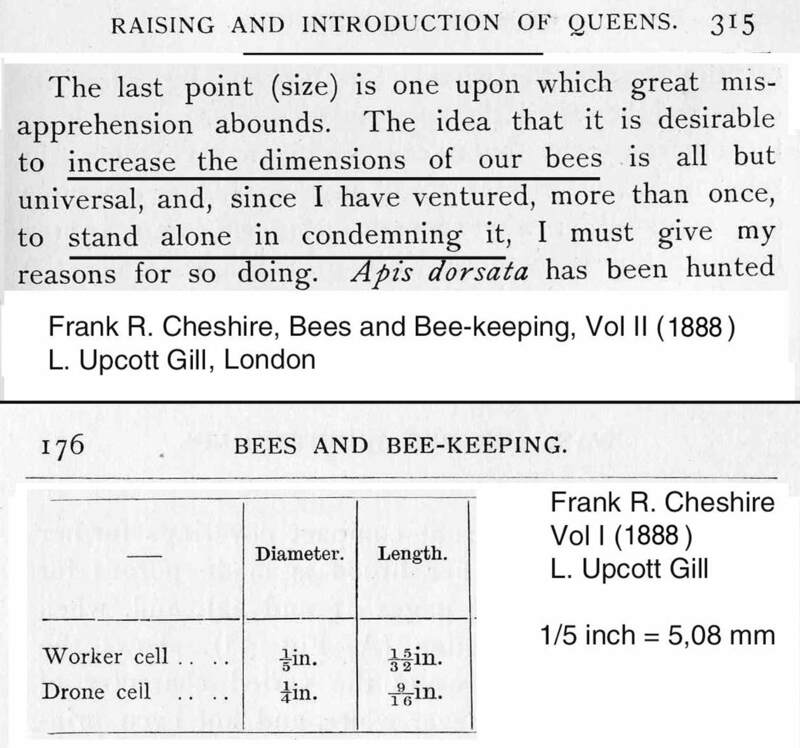 The conclusion is that you have to read the original books and articles where the figures are presented to see if you can find out how accurate the measurements are concerning how natural the cellsizes of these bees are. 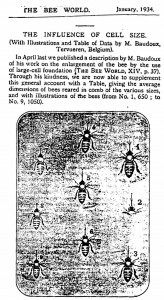 Thomas Wildman in England in his “A Treatise on the Management of Bees” (1770) gives 4.6 mm to 5.1 mm cellsize. 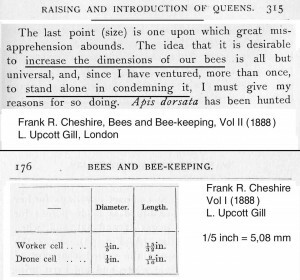 T W Cowan in England in his ”The Honey Bee-Its Natural History, Anatomy and Physiology” (1890) gives 4.72 [1.86 inch/10cells – decimals!] to 5.36 mm [2.11 inch/10], page 181). Cowan also gave the average to be 1/5 of an inch ≈ 5.08 mm. That’s an easy figure – 5 cells to the inch (a common way of naming this size of wax foundation was 900 cells/dm2, which once was how wax foundation also was called, by how many cells/dm2 they gave). A I Root in USA adopted 5 cells to the inch for the first commercial wax foundation milling rollers in 1876. 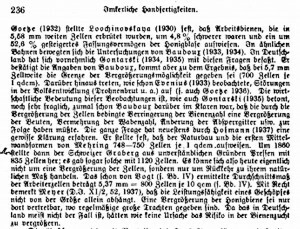 Usmar Baudoux from Belgium in the late 19th century propagated for enlarging bees to get longer tongues in the bees and bigger honey crops. He thought 700 cells/dm2 was a good size (5.74 mm cellsize). He published a number of articles in the magazine Bee World in 1933-34 on the subject. H Gontarski published in 1935 his work on using large cellsize. He came to the conclusion that 5.8 mm cellsize was the upper limit. Bigger cellsize and the bee colony couldn’t grow in strength. Here we are talking about cellsizes for the brood. 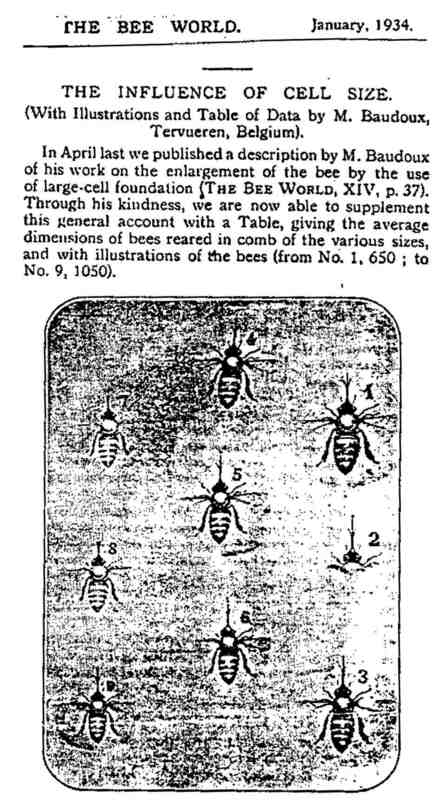 An illustration in Bee World January 1934 by Baudoux showing the differenses of the sizes of worker bees born in different cellsizes. The biggest bee (no 1) born in 6.0 mm cell. The smallest (no 9) born in 4.7 mm. Some text examples from the book of Frank Cheshire. The understanding why there was a difference in cellsizes even on the same comb seemed to be lacking. 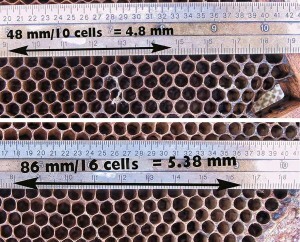 Different cellsizes are most often used for different purposes, brood in smallest, honey in the biggest. New foundation was most often given to bees in the honey supers above the brood, where sizes normally are bigger than in the broodnest. 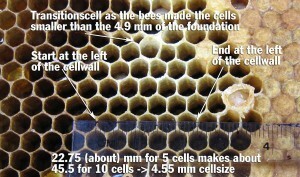 Remember 5.1 mm cellsize (5 cells to the inch) was an average for all sizes of cells in the bee colony. Now these bees earlier born in smaller cells helping to draw smaller cellsizes correctly weren’t there, they were not born any longer with the arrival of wax foundation. the food they get. And the food is also dependent on the cellsize. Sometimes this created problems for the bees to draw the foundation well enough, especially when the honeyflow was rich – the bees wanted honey storage cells. The best place for drawing out small cells is below the broodnest, the next best in the middle of or at the sides of and close to the broodnest. 2. that cellsize shouldn’t be bigger than 5.2 mm. 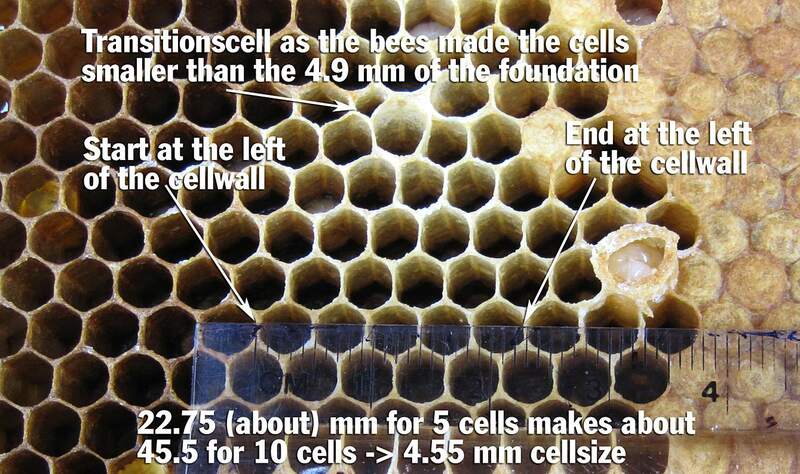 The argument for not smaller was that the bees drew the 5.2 foundation better than 5.1. The argument for not bigger was the same as Frank Cheshire in England used. Cheshire strongly argued against enlargement as the bees would come out of tune with nature. But Cheshire argued to not enlarge from 5.1 mm. 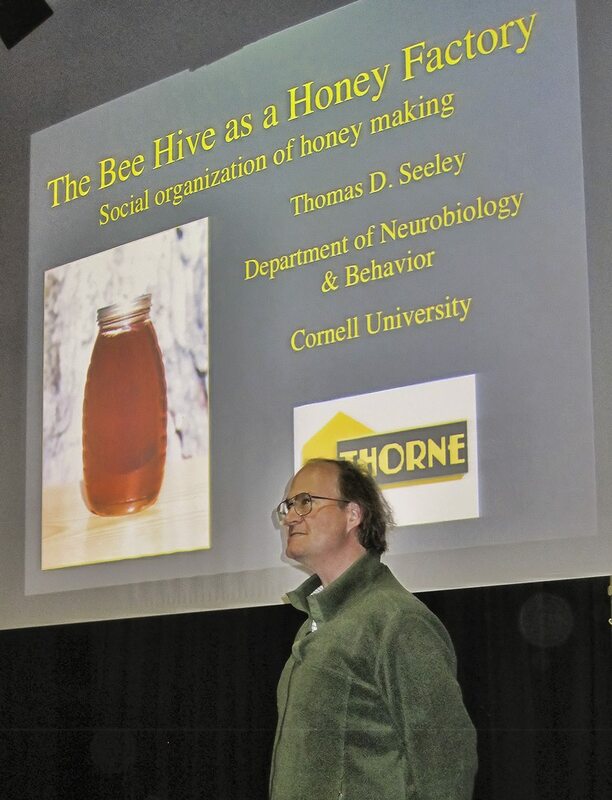 Thomas Seeley’s measurements in Arnot forest in northeastern USA of feral bees are used sometimes as argument against small cells. His result is though 5.2 mm cellsize – in average. And you know what average means don’t you. Smaller cellsizes where the brood is and the biggest sizes where honey is stored. The inbetween sizes used for both when needed. 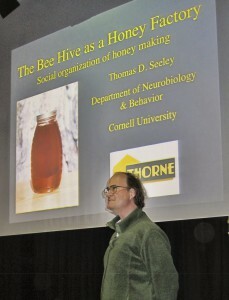 Tom Seeley gave a number of excellent talks on the London Honey Show in October 2011, which I listened to. One described in detail his work investigating feral bees in the Arnot forest. 2002 Leif Hjalmarsson in southern Sweden took care of a colony from a widow that had lost her husband 10 years earlier. He had been a beekeeper with ten colonies. No one touched them after his death. It might have been a swarm that had entered one of the hives, or a surviver, that Leif took care of. Many combs were reworked by the bees. Evidently the cellsize of the foundation once used had been 5.4 mm. Now the cellsizes ranged between 4.77 and 5.4 mm. A couple of the measurements from reworked comb from the colony Leif Hjalmarsson took care of. Myself I have measured down to 4.55 mm for sizes where my bees have had foundationless combs or similar. Quite common sizes were around 5.0 and sometimes up to 5.4 mm. I normally use 4.9 mm cellsize foundation in the broodnest. Most of my bees have no problems drawing 4.9 foundation well. After selection for varroa resistance they even draw 4.9 foundation well in the supers. A coincidence or a side effect? They winter well, give good honey crops and don’t swarm more than when I had them on large cells. Here my bees didn’t follow the 4.9 pattern of the foundation when they rebuilt some cellwalls after I had taken them down for easier grafting larvae when queen rearing. Here they had drawn them 4.55 in the area rebuilt and the queen had layed eggs in the cells. I like to think my small cell bees are more in tune with nature, more biologically optimized and therefore better armed for living a healthy life with little or no special help from me. I have prepared for and selected for varroaresistance for quite some years. Last year I learned how to test a colony for VSH, a simplified method described by John Harbo, easy for everyone to use. Before that I just allowed a mite pressure in the colonies until they showed virus problems. That meant in practice appearance of wingless bees, DWV-bees, either on the comb, but still easier, on a hardboard in front of the entrance. (Bees with very little resistance are though not quick in throwing out of the hive DWV-bees, or other virus-troubled bees.) You have to visit the apiary every 10 days or so, but a quick look will tell you, plus a look in the hive after opening the inner cover to check how the colony develops. No need to check down in broodnest unless you register something seems to be wrong. Those colonies that keep going and develop normally without any symptoms, during which time no treatment has been done, they are of course then candidates for being breeders, especially coming spring. In autumn 2011 I had three colonies that had been big colonies (not newly started splits during that year) without treatment for the whole season with no signs of varroa or virus. The winter and coming spring would tell which one, if any, or all, would be able to be used as breeder in 2012. That happened to be only one, H157. Good to remember is that varroa first began to be a problem in 2008 with first bad winter in 2008-09 and 50% losses. Next winters no such losses. In autumn 2012 I had 11 breeder candidates. In spring 2013 I had at least 5 I judged I could breed from, but that year focused most on VSH. I had just learned to know I could. I learned about VSH testing that spring in 2013 and did VSH-testing on three colonies. One was a swarm that looked promising and nice. The mother colony was a feral colony in the wall of the dogtraining center, well within the area of my type of bees. The swarm showed 50 % VSH, half of the pupae with mites had mites without offspring. So even if this colony hadn’t been going for a whole season plus another winter without treatment I used it as a breeder in 2013. I named it S120. The second I VSH-tested colony had been a very small the year before and not really a production colony then. But it was in an environment with big colonies which needed thymol so I decided to test it and it showed 40 % VSH (4 pupae with mites had no mite offspring of the 10 pupae with mites found). K25 it was named. But it was quite aggressive. I decided though that varroa resistance in this stage was more valuable. The mother of R137, H109, of course also was used as a breeder due to its history, but she was old and layed 50 % drones in worker cells. Couldn’t really make any VSH test I decided. I grafted one time and killed her. The fifth I used showed itself to be very old as well and fell off the comb and died just after taking her home in a small split. No VSH-test. That colony I had thought had a new queen that had past the test. But this colony with this the old queen, though good, had been treated every second year with 10 grams of thymol (very little actually relatively) during four years. M176. Why do I tell you all these details? To come to the point for my situation, soon, be patient. Late in season 2013, S120 showed a couple of wingless bees and got 10 grams of thymol. K25 which really hadn’t had a real production season before it was choosen swarmed thee times in July in 2013! I have never experienced that before, ever. R137 has some peculiar traits. It supercedes its queen every year it seems. And some daughters do too. This year a few wingless bees were seen and it got 10 grams of thymol. I never do regular swarm controls in my colonies. Usually about 5 % of my colonies swarm. This year many daughters from two breeders from last year 2013 swarmed, from S120 and K25. And almost all daughters from these breeders needed thymol. Some of the daughters of K25 were very aggressive. Remember all queens are mated naturally in the apiaries. The apiaries together form an area with only my type of bees. BUT maybe it was worth it using the breeders that disappointed me. I must have genetic diversity in my stock. I can’t make queens from just one line (H157). I have one daughter of S120 and one of K25 that are really outstanding in resistance, honeycrop (more than 150 kg (300 pounds)), very good temper and no swarming tendency. H109 has more than one good daughter. M176 as well. And then there are walk away splits with heritage from the first breeder chosen for resistance H157, which are breeder candidates for 2015. Maybe I will use as well the three breeder used this year, or two of them. The autumn of 2013 I had 36 breeder candidates. I could have bred from more, but I choose to breed from three this year 2014, of which two are sisters, daughters of H157. These are H112 and H105. H157 had quite some daughters worthy of breeding from. The third breeder this year was L242. After using these three, in the middle of July I made the VSH test on them. In all three the infestation rate in the brood was about 5 %. H112 had a VSH value of 80 %. H105 – 67 % and L242 had 33 %. No treatment was needed for this year either for H112 and H105. L242 got 10 gram thymol late in season. L242 came from a quite isolated apiary with small reinvasion and was moved to my home apiary and probably got more reinvasion here. But all three are wintered very strong. Maybe I will use H112 and H105 in 2015 as well, we’ll see. Now to my point. It seems under my conditions it’s better to focus in first hand on one whole season as big colonies during which no treatment should have been needed (including winter and coming spring), to select breeders. BUT then use VSH testing to tell you which one probably are the best among them, and get confirmation of their status. Of course the breeders must be good in other respects, good honeycrop, good temper and low swarming tendency. VSH is a good tool for selecting for Varroa resistance, especially when there are difficulties using anything else, but also as a complement when other methods are used. I’m glad I can make VSH tests, in addition to the DWV-test I use.